Alive! Pea Shake Vanilla / 2.1 lbs - Nature's Way®. 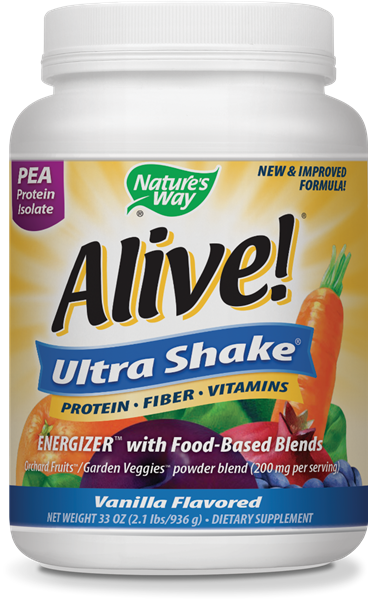 Alive!® Ultra-Shake™ Pea Protein is a comprehensive multi-vitamin with the added benefit of pea protein. The powder is easy to mix with water, juice or milk – no blender required. Caution: If pregnant, nursing, taking any medications, or have high blood pressure, consult a healthcare professional before use. This product contains the amino acid phenylalanine. Keep tightly sealed and out of reach of children. Store in a cool, dry place.